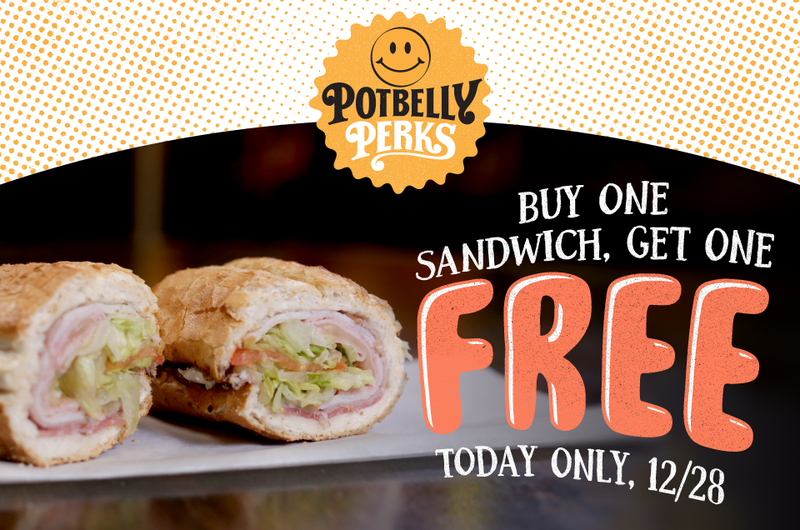 Savvy Spending: Potbelly Sandwich Shop: B1G1 Free today only, with app! 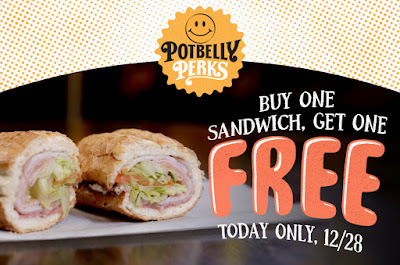 Potbelly Sandwich Shop: B1G1 Free today only, with app! Today only, you can get a B1G1 Free deal at Potbelly! Buy any Originals, Skinnys or FLATS sandwich and get one free today for a friend (or to keep for yourself). To redeem this Perk, be sure you're logged into your Potbelly Perks account on the mobile app or online before ordering or scanning in-shop. Simply add 2 Originals, Skinnys or FLATS sandwiches plus toppings to your order and the second sandwich of equal or lesser value will be deducted from your total at checkout. This offer is good for today, Thursday, December 28, 2017 only. Buy One, Get One Free Originals, Skinnys or FLATS sandwich offer valid only on December 28, 2017. One free sandwich per customer. Offer may only be redeemed once and must be redeemed on the same transaction. This free sandwich offer is good for one Originals, Skinnys or FLATS sandwich up to $8.00 with purchase of equal or greater value at participating U.S. Potbelly Sandwich Shops. Not valid for orders placed by fax or telephone or with any other offer, discount or coupon. No cash value.